In Greenwich Village, the 312-square-foot space - big enough for about two and a half cars or around 20 people to sit comfortably - was at or near capacity during most of the afternoon lunch rush. The space felt intimate and, dare we say, calm, even as cars whizzed by a few feet away. Barbara A. Blair, the president of the alliance, said the garment district needs more public spaces because foot traffic has increased. The neighborhood, which is sandwiched between two popular tourist destinations, Times Square and Herald Square, has become home to 37 new hotels since 2005.
facebook plans to construct a a 'mixed-use village' consisting of 1,500 new homes, a grocery store, a transit center, shops on their menlo park HQ. facebook plans to construct a a 'mixed-use village' consisting of 1,500 new homes, a grocery store, a transit center, shops on their menlo park HQ. 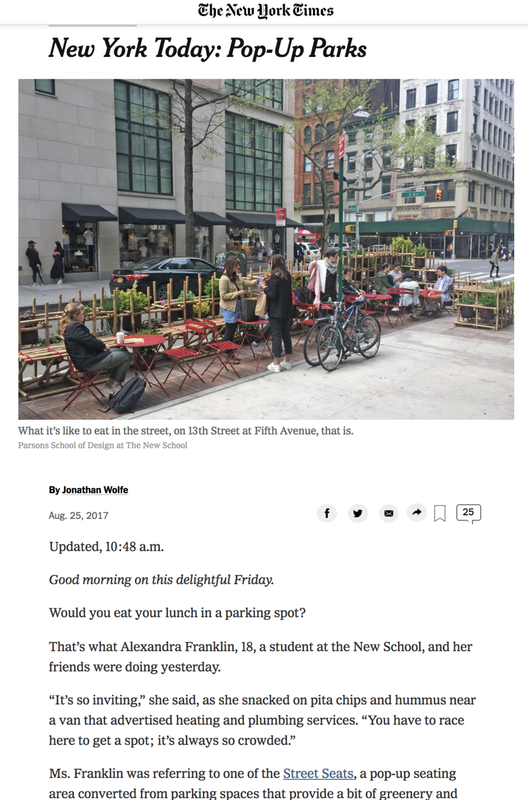 This year’s Street Seats — Parsons School of Design at The New School’s annual student-design pop-up seating space presented in collaboration with the NYC Department of Transportation — is changing and evolving over time. That’s because it’s made with myriad planters and movable seating. When it’s taken apart seven months from now, it will have taken many forms — a living design-build project in addition to a space for the public to relax and enjoy. Designed and built by students of Parsons’ BFA Architectural Design, Integrated Design, and Product Design programs, and overseen by Parsons faculty members Huy Bui and Carlos Gomez de Llarena, this year’s Street Seats was constructed using bamboo, a sustainable material; drought-resistant plants, which reduce maintenance needs; and Voltaic Systems Arduino-donated solar panels and LED lights, which connect to a microcomputer that turns the lights on at night and lets their batteries recharge during the day. It is located just around the corner from the entrance to the University Center on 13th Street and Fifth Avenue. The project is the creation of BFA Architectural Design students Reem S. Abi Samra, Javier Contreras, Yeshayahu Gansburg, Finn Harries, Albert Liu, Naiky Paradis, Mahalakshmi Sivakumar, and Pranati Kotriwala; BFA Product Design students Russell Conway, Seung Chae Kang, and Michael Phillips; and Alyson Thompson; and BFA Integrated Design students Katelin Collier and Charlotte Hoefer. Research assistant were Jeana Chesnik, MFA Design and Technology and Gabrijela Korac, MFA Lighting Design.